Indulge your creative side at Second Saturday Workshops. 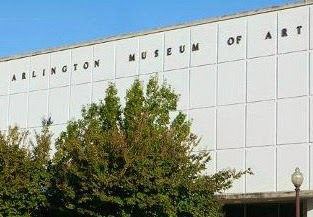 The Arlington Museum of Art presents art workshops for adults on the second Saturday of every month. This month on February 8th you can learn about costume making. This class ties in nicely with their current exhibit, Artists in Motion. For more information about signing up for this workshop or to see what is coming up later this year, check out the museum's website. Arlington, TX – The Arlington Museum of Art is proud to host the "Artists in Motion" exhibit highlighting the grace and beauty of dance and other stage performers. The exhibit features professional costumes on loan from Texas Ballet Theater and Dance Theatre Arlington, as well as paintings from. The exhibit runs from January 11, 2014 through February 16, 2014. The opening reception for sponsors and members will be Friday, January 10, 2014 7-9 p.m.
Several paintings, pastels, sketches and studies by locally based artist Donray, a Houston-born artist who worked and studied in New York City, will be featured. Donray’s unique style of painting emphasizes color and motion which perfectly balances the exhibit. Skilled in various media and techniques, Donray has exhibited in New York City, Washington, D.C., Houston, London and Dallas. Accompanying the two dimensional work will be dramatic pieces from well-known ballet and musical theater productions. North Texas’ award winning costume designer Ric Leal, whose production credits include Dallas Theatre Center and Bass Performance Hall, is providing intricately detailed pieces previously featured in acclaimed stage productions throughout North Texas. Three traditional tutus designed by Texas Ballet Theater’s wardrobe manager Masako Parshall will anchor the exhibit, in addition to pieces she created for other TBT productions. “This exhibit examines what captivates us about dance, grace and majesty, as well providing a glimpse into the power and message conveyed by stage performers. We are proud to host this collaborative exhibit with our partners Texas Ballet Theater, Dance Theatre Arlington, costume designers Ric Leal and Masako Parshall and the art of Donray,” said Chris Hightower, Executive Director of the Arlington Museum of Art. The museum will also offer a number of programs, artist workshops and lectures in addition to the exhibit that will enhance the visitors’ experience. Tickets for the "Artists in Motion" exhibit are available at the museum.